You can install raised decking around your pool. This decking can be used for chairs, tables, and grills. Having these elements located near your pool will make it an appealing area for family and friends to gather during a party. You may also install different types of landscaping around your above ground pool. Large trees, bushes, and hardscape structures can line the areas around the pool. If you want the entire family to participate in outdoor fun together, then install a volleyball net over your above ground pool or a basketball hoop next to your swim spa installation. These are easy ways to engage your kids with fun exercise outside. There are many types of above ground pools, such as Doughboy pools and swim spa installations. When you choose Doughboy for your above ground pool in Birmingham, AL, you will receive a strong, durable, and portable swimming pool. These qualities make your above ground pool exceptional, but Doughboy becomes even better with the addition of a deeper swimming area. Read on to learn more about Doughboy above ground pools . They are strong swimming pools. Doughboy above ground pools are one of the strongest installations available. They are made with steel frames and several protective layers and coatings that will resist corrosion. Doughboy also offers a resin pool frame that is exceptionally strong and durable. Either choice will be a stable and long-lasting swimming pool in your backyard. They come with a deep swimming area. Unlike other above ground pools, hot tubs, and swim spa installations, Doughboy pools come with the option for a deep swimming area. These pools are already large and deep, but a qualified pool installer can install your pool up to seven feet deep into the ground. The deeper area will be a gradual decline in the pool, but it can provide even more fun for you and your family. They can last for decades. Due to the strong steel or resin frames, Doughboy pools have been found to last for more than 25 years. Doughboy utilizes high-quality, durable materials that will keep your pool frame, pool liner, and pool equipment working for several years without repair or replacement. This will equal a great return on your Doughboy investment. They are portable swimming pools. 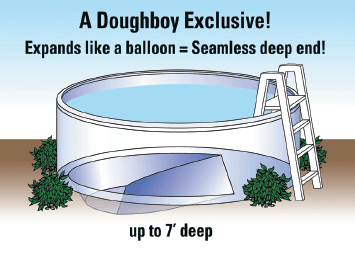 Doughboy above ground pools were made with portability in mind. If you choose to move, you can bring your Doughboy pool with you. The frame and walls can be disassembled easily, and you can move your pool without difficulty. You will have to replace your pool liner, but your qualified pool installer can help you choose and install the right liner. Inground pools and swim spas are the perfect solution if you are looking to better your health and physique . Swim spas in Birmingham, AL offer you the capability to get an all-over workout even when you perform a light and gentle swim. Watch the video to see Olympic Gold Medalist Michael Phelps tell you the many benefits of swimming in your swim spa. Swimming every day can give you long, lean, and strong muscles across your entire body. You won’t just look good, but you will feel great with a strong core and body. Even if you swim casually in your swim spa, you are burning calories and getting a full body workout to last for life. You can look and feel healthier and stronger with regular swimming in your swim spa, so start as soon as possible. When you are seeking a fantastic addition for your backyard deck, you may want to consider installing an above ground pool. With the help of a company that offers small swimming pools near Birmingham, AL, you will be able to add an above ground pool or swim spa to your deck design. Today’s swim spas are available in a variety of shapes and styles that make them perfectly suited to any deck design. After you work with a company to install a new above ground pool in your home, you will be ready for fun in the sun, all summer long. For more information about what to expect from your new above ground pool, check out this video. 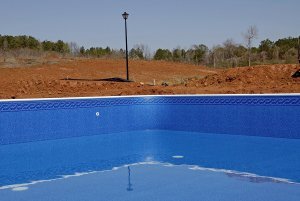 There are many different swimming pool design elements and pool parts that you can customize when building an above ground pool near Birmingham . For instance, you can choose between a number of above ground pool liner materials and styles depending upon your budget and aesthetic preferences. Here is a look at some of the most popular above ground pool liners available for today’s swimming pool designs. Overlap pool liners are the most cost-effective type of above ground pool liners. They are also very easy to install, require minimal pool maintenance, and work with almost any above ground swimming pool design. This type of pool liner attaches to the pool wall using coping strips, which are pieces of plastic that run along the length of the top of the swimming pool’s deck or wall. 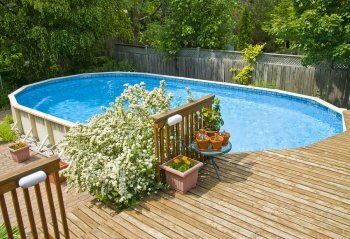 It overlaps the swimming pool deck from the inside, preventing water from damaging the pool deck or structure. Beaded pool liners are the easiest above ground pool liner to replace, and pool repair is typically simple and inexpensive. These pool liners come in a wide variety of styles, designs, and colors to match your overall swimming pool design. The liner consists of a bead receiver that hangs over the top of the above ground swimming pool’s wall or pool deck. The beaded pool liner then snaps into this receiver, preventing damage and creating a cohesive, unified look. This type of above ground pool liner is usually used for backyard pools with a consistent, flowing swimming pool design that can be echoed or repeated in the pool liner’s pattern. Unibead pool liners are the most versatile type of above ground pool liner. They consist of a two-in-one feature that allows you to attach replace an overlap liner with a unibead liner. This type of pool liner can attach to either a bead receiver, or a j-hook. There is no excess pool liner material hanging over the pool’s deck as there is with an overlap liner. Shocking your above ground swimming pool is a very important element of basic swimming pool maintenance in Birmingham . 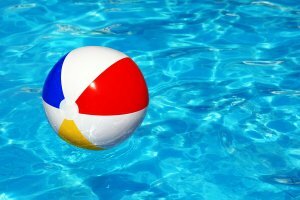 Shocking your pool refers to adding pool supplies like chlorine or other chemicals to the swimming pool. This should be done about once per week during the swimming pool season in order to prevent contaminants such as algae, chloramines, and bacteria from building up. Watch this video for a simple, step-by-step guide to shocking your swimming pool. You should include swimming pool shocking into your routine above ground swimming pool maintenance when you notice that algae has begun to grow in your backyard pool, the free chlorine level of your swimming pool is zero, or the combined chlorine level of above ground pool rises above 0.5. When you’re looking for a way to exercise, relax, and have fun all at the same time, consider getting an outdoor pool in Birmingham . Swimming pools cool you off during the hottest times of the year, and make your home the place to be for gatherings with your friends. As you start thinking about the swimming pool installation process, you’ll have many decisions to make. If you don’t have a lot of space, a swim spa may be the right choice for your yard. Take a look at your available space, and consider how much you’re willing to have taken up by an above ground pool. You can choose from different sizes and shapes to match your needs. Remember to consider the landscaping surrounding your pool, and you can create a beautiful backyard oasis. Adding water features or a separate hot tub can make your yard even more of a relaxing place, transforming your home into a spa-like destination for your friends and family. As you begin to think about having your own swimming pool in Birmingham , consider all of the design possibilities that are available to you. You might want to combine the benefits of a swimming pool and a spa and have a swim spa installed, or you may prefer the look of an above ground pool. A vanishing edge pool is an elegant choice for your yard, so watch this video to learn more about what it takes to create one. Vanishing edge pools are sometimes known as illusion pools, since they create the illusion that the pool has no finite ending. This is an excellent choice for a pool when you have a view you don’t want to obstruct, such as hills or a valley. If you have your yard fenced in close to your pool, a vanishing edge may not be the right choice as it is just the fence that will be reflected on the pool’s surface. You can erect structures around the pool to maintain your privacy while still enjoying incredible views.